The ECC81 (12AT7) Valve/Tube for sale. 12AT7 (ECC81) Valves For Sale. We sell the superb 12AT7 valve, also known as the ECC81, made by JJ. JJ are one of only three valve manufacturers in the world so you know you are buying from the source. Don’t pay more for rebranded versions of exactly the same valve. Click here to see our prices. The 12AT7 Valve is a small preamplifier valve with two identical triodes both of which have a high voltage gain. 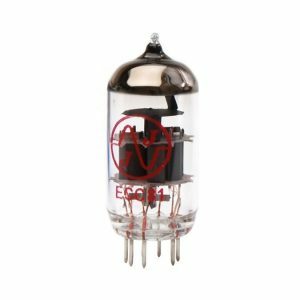 The 12AT7 (also known in Europe by the Mullard-Philips tube designation of ECC81) is a miniature 9-pin medium-gain (x60) dual-triode vacuum tube popular in guitar amplifiers. 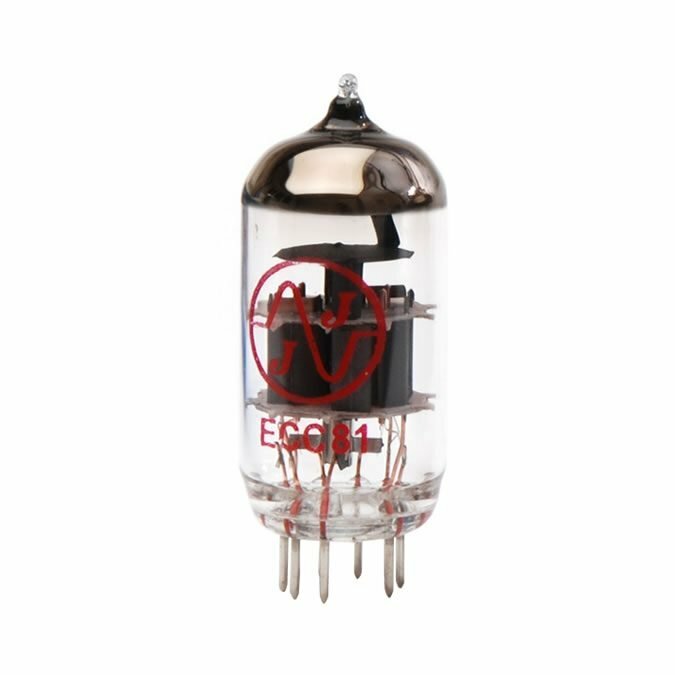 It belongs to a large family of dual triode vacuum tubes which share the same pinout, including in particular the very commonly used low-mu 12AU7 (ECC82) and high-mu 12AX7 (ECC83). The 12AT7 (ECC81) has somewhat lower voltage gain than the 12AX7 (ECC83), but higher trans conductance and plate current. This makes it suitable for high frequency applications. Originally the tube was intended for operation in VHF circuits, such as TV sets and FM tuners, as an oscillator/frequency converter. However, it also found wide use in audio as a driver and phase-inverter in vacuum tube push-pull amplifier circuits (which almost all valve guitar amplifiers use). This tube is essentially two 6AB4s or two EC92s in a single envelope. The reason the 12AT7 (ECC81) valve is used so much is because it’s actually two identical valves in one envelope! So designers can get two gain stages using just one 12AT7 valve. In technical terms, the 12AT7 valve is a “dual medium gain triode”. ‘Dual’ – there are two valves in the one glass envelope. ‘Medium Gain’ – speaks for itself. The gain is about x60 compared with x100 for the ECC83. ‘Triode’ – the ‘ode’ part refers to electrode. So each valve has 3 electrodes. A Cathode, an Anode and a Grid. How on earth do they pack all that into one 9-pin envelope! 6 pins are taken up by the cathodes, anodes and grids. But each valve also has a heater, so that would need another 4 pins. 6+4=10 and we only have 9 pins! So on the 12AT7 (ECC81) valve they put the heaters in series and bring out the two ends and a centre tap. Neat – and only 9 pins. You can put 12V across both heaters, or 6V across the individual heaters and ground the centre tap. 12AT7 versus ECC81 valve. Compare the two. The answer is simple – there is not the slightest difference between an ECC81 valve and a 12AT7 valve. They are identical. They only differ in name. Confusing, but there it is! One (12AT7) is the American designator and the other (ECC81) is the British. 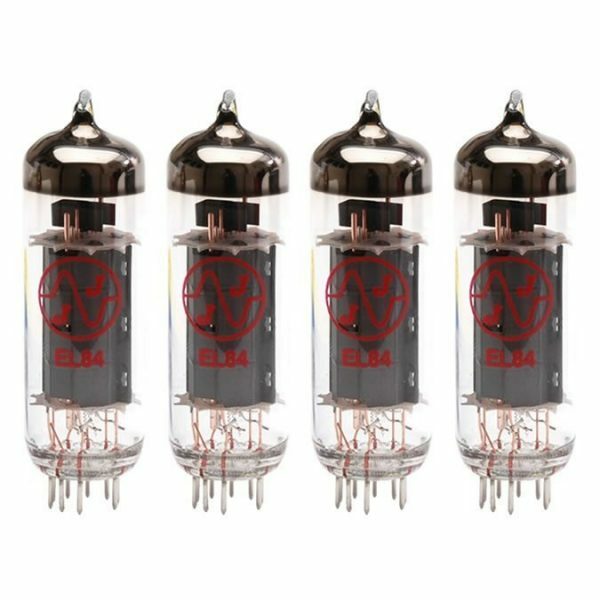 If you own a valve guitar amplifier it is highly likely to have at least one 12AX7 (ECC83) in it. You may also have an ECC81 (12AT7) but this is rarer. The preamplifier guitar amplifier valves (e.g. 12AX7 or ECC83) take the very low level signal from your guitar and amplify it up in several stages. For reasons I won’t bore you with, you can only get a certain amount of gain from a single valve stage—so you need to cascade several guitar amplifier valves to get the gain we need. This is where it’s very handy to have two separate amplifiers (triodes) in each 12AX7 (ECC83) envelope. You get two stages of gain for the price of one! Because the 12AT7 (ECC81) has a lowish current capability, you can’t use it to drive the speakers. For that you need bugger, beefier power valves. The 12AT7 (EXCC81) is confined to the early stages of your amplifier where it boosts low level signals to useable levels. The 12AT7 (ECC83) is also often used to recover the very low level signals coming from the reverb pan (although sometimes this is done with a solid state circuit to save costs). A typical valve guitar amplifier will have between 3 and 6 preamplifier valves and these are almost always 12AX7 (ECC83) valves with the occasional use of a 12AT7 (ECC81) or 12AU7 (ECC82). So now you know. There is no difference between a 12AT7 valve and an ECC81 (apart from the printing on the side) – you can buy either. The 12AT7 equivalent is the ECC81. If you need 12AT7 (ECC81) valves you can buy them here. ← 7025 valve – Is it equivalent to the ECC83? My amp has 2 of these!